One of my most vivid memories as a child was my mother entering my room in the morning to wake me up. She would open the curtains and sing in an irritatingly perky voice, “You are my Sunshine”. It drove me crazy. I blame this ritual for my lack of desire to speak to anyone in the morning now before I’ve had a cup of coffee and, not surprisingly, for my particular interest in making sure it tastes just right. Recently, I had the chance to review the Remington iCoffee maker. Upon first brew, I was greeted with a Mozart tone when brewing started and again when it ended. I hesitated momentarily and had to suppress my early childhood memory moving toward consciousness in my brain. After a week with Mozart, however, I must say that I grew fond of the quick tune accompanying my morning coffee ritual. You do have the option of turning this off, however, for sanity’s sake. If you look forward to your daily drip at Starbucks to satisfy your desire for a strong coffee with a bit of an edge, this may not be the coffeemaker for you. For those who like a smooth, creamy texture to your brew, this maker delivers. 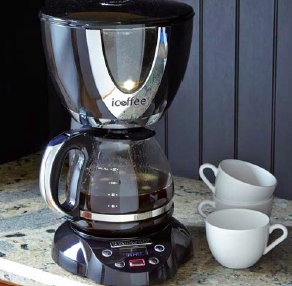 The iCoffee touts a unique steam brewing method and double-permanent filter combination. No need for disposable paper filters. This notable filtration system claims “to eliminate any bitter and acidic aftertaste, at the expense of leaving behind a finely extracted coffee essence (sediment)” in your cup. The optional second filter does help reduce this sediment, although I found the taste without it was relatively the same. “Good to the last drop” may not apply here, as I didn’t enjoy the sediment in the last swig of coffee, However, the rest of the cup was delightfully smooth. The iCoffee uses far less beans than a normal maker to deliver a superb pot of coffee. I played around with the ratios and found that a little over a half-tablespoon of beans per cup of water produced a strong, yet pleasant cup of coffee (I usually use a tablespoon of beans per cup). Any less than that seemed to produce a watered-down taste; more seemed to produce a harsh bitterness. While the company does advise to use a medium to coarse ground coffee, I discovered a course grind ensured the best results with the double filter system. I tried the maker with two sets of beans: A robust Starbucks Sumatra and a dark roast Trader Joe’s Café Pajaro Blend. The Starbucks coffee beans best suited my love for a rich, dark brew that stimulated my senses with an intense and deep aroma. Overall, I would recommend this coffee pot to anyone who is interested in trading in the edge and bold in the morning cup for a more delicate flavor and texture. The iCoffee definitely delivers on its promise of a different, delicate, and delectable brew. Now, if only we could get the iCoffee to play, “You are my Sunshine,” even my mother would love it!